Katie - Everybody, in front of you there are two plates of roast potatoes. One has been made by Eva (and are insubstantial!) One has been made by Katie, me. Eva’s made hers with olive oil. I have made mine with goose fat. Question is: which one do you prefer and which one do you think is which? Beverley, you’re a vegetarian, so I think you might want to sit this one out. There are forks in the middle. Please if you’re feeling brave enough have a taste. Chris - We don’t know whose is whose yet. This is a blind tasting. Katie - Roast potatoes. Everybody knows they are a staple at Christmas dinner. Everyone also knows that goose fat will trump olive oil. Eva - It's not the first time I've made roast potatoes and it's not going to be the first time I've made the best roast potatoes. So sorry Katie, but I don't know how much luck you’re going to have here. Katie - Well let's see shall we. Step one: peel the potatoes. Eva - Step two: chop them into roughly similar sized pieces and I decided to rinse the chopped potatoes to get rid of any excess starch. Katie - Step three: heat up the water with the potatoes in to boiling and leave for about 10 minutes. I added a rather over-generous amount of salt as well. Now for me it was time to heat up the goose fat. It looks pretty gross to be honest. Right, my two trays are coated. They are going in the oven, which has been preheated to 200 degrees. Eva - But for me, none of this preheating the fat nonsense. Step four: drain the parboiled potatoes and then slather in olive oil. Katie - Well I disagree about the olive oil, but step five was to put those potatoes in the oven and roast for at least 20 minutes. Listen to that, that’s lovely. Katie - Clare you're looking quite quiet in the corner. Clare - I am eating, yes. Katie - Which one do you think you have eaten? Clare - I think the one with rosemary is the one with goose fat and the one with garlic is the one with olive oil. Katie - Which one do you prefer? Clare - I like both of them they're just different. Katie - Caitlin have you had any? Caitlin - I have. I had a try of each and I would have to say I prefer the olive oil. I would say they're the one on the left with the garlic. 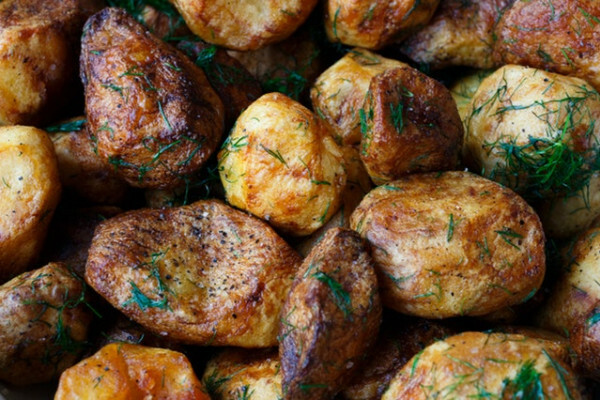 Katie - Rishi have you been brave enough to try these roast potatoes? Rishi - I've taken one off each plate. I'm going to go with the ones on my left which are the non olive oil ones as my favourite. Chris - I'll give you a vote for that too. I love those ones and I think those are the goose fat ones. They are definitely superior. Katie - Marvelous. Thanks Chris. Eva put us out of our misery, which is which? Eva - So mine are the ones with olive oil and they've got garlic on them and they're the ones on the left and I do think they're better personally. The goose fat is a bit of a strong flavour for me but there you go. So some people preferred yours, some people preferred mine. Katie - But everyone accurately told them apart. Eva - Yes that's true. Everyone did guess correctly which is which, which goes to show the flavour of the fat of each of them must be quite strong. Katie - We had a little conversation about this, well we had an argument about it in the office, let's be honest. I added salt to my water when I was parboiling the potatoes and I don't really know why. I wonder if it’s a bit of a mythical thing, I've been told that this is something that's good to do. Is there any science behind it? Eva - To be honest, some people say you should add salt to water when you’re boiling vegetables, and maybe there's something to do with flavor in there, but with roast potatoes you’re going to season loads of them afterwards. One of the other reasons people think you should add salt to water when you’re boiling things is it actually raises the temperature at which water boils. So that means that when the water is boiling away really hard with your potatoes in there. It’s actually boiling at a higher temperature. So the idea is that if you add the salt then potatoes or whatever vegetable will cook faster because the water's hotter. But it is only a 2 degree difference. I don’t know what that works out mathematically but its not going to be that much quicker is it. So I never bother putting salt in with mine. Katie - So unless you have to make the speediest dinner imaginable maybe there’s not much point. Eva - Exactly. That's my opinion anyway. Katie - Now we used different oils. I still maintain that goose fat taste better, but they have different smoking temperatures don’t they? As I understand it goose fat has a bit of a higher temperature at which it will smoke compared to virgin olive oil, which is what you used. Does this have any scientific relevance when it comes to making roast potatoes? Eva - Well people tend to say that when you’re roasting something you want to use a high temperature and that means you want to use an oil that’s able to cope with a high temperature without smoking up your oven. Katie - This is because you want really crispy, delicious, golden brown roast potatoes right? Not mash? Eva - Exactly. With the goose fat having a higher temperature, that means that you should be able to turn your oven on a little bit higher, a little bit hotter which will give you perhaps a more crispy outside. Whereas olive oil, if you have it at that same temperature it’s going to start smoking a little bit and maybe change the flavour as well as not giving you the nice crispy coating. Katie - Maybe it'll mess your oven up as well. Chris are you convinced of the science of our roast potatoes? Chris - Yeah. It’s also not so good to have certain oils at very high temperature either is it, because then you actually begin to damage the integrity of the oil. Olive oil is very good for you when taken as raw virgin olive oil, but when you bake with it I think it becomes potentially quite bad for you because it oxidizes and so it’s actually better to cook in lard I think. Katie - So, are you saying scientifically I win? Chris - Well we were doing a taste test rather than the scientific credibility test. But I mean flavor wise I personally really like very fluffy very bad for you tasting potatoes because I don’t do it very often. They were both really nice but for me the goose fat ones were nicer but that wasn't equalled by or agreed on by everyone here was it. Katie - Okay well let’s call it a tie. That’s fair. That's just Christmassy. Eva, thank you very much and thank you for bringing the roast potatoes. I'm going to try and not drool for the rest of the programme! Chris - We let you have one eventually Beverley once you knew what you could eat. Beverley - It was great, really good thanks.